Director Samuel Fuller (1912-1997) made movies that, on the surface, looked like ordinary genre films and even moderately sleazy exploitation pictures, but under the surface his best movies progressively tackled serious social issues, told with a beguiling mixture of empathy, understanding, verisimilitude, and grit. He had an unusual career that, in some respects, paralleled Orson Welles. They made different kinds of movies under differing circumstances but, like Welles, Fuller was a maverick that almost never compromised his deeply personal visions. After many years as a screenwriter and low-budget features as a director, Fuller hit the big time in the early 1950s, on a series of high-profile pictures he made at 20th Century-Fox. He left the company after completing Forty Guns (1957), Fuller, having already formed his own independent production company, Globe Enterprises, whose half-dozen titles were distributed by various studios. The Crimson Kimono (1959) was the next-to-last Globe production. Typical of Fuller's movies from the period, it was made on a shoestring budget (probably $150,000 or less) and outwardly resembles a cheap program picture, in this case the story of two LA detectives investigating the murder of a stripper. Fuller's script, however, is really a startlingly rich portrait of interracial love, friendship, and identity. Stripper Sugar Torch (Gloria Pall) is shot dead in the middle of Main Street, downtown Los Angeles, and detectives Joe Kojaku (James Shigeta, in his best film role), a Nisei (second-generation Japanese-American) and Sgt. Charlie Bancroft (Glenn Corbett) are assigned the case. Sugar had been preparing a new kimono strip tease act she'd hoped to open in Vegas, complete with block-chopping karate lover and samurai-like rival for her affections. She also commissioned a conceptual painting of herself from Christine Downs (Victoria Shaw), an art student at a nearby university. Longtime bachelor Charlie is instantly attracted to the pretty young artist, wrongly assuming the feeling's mutual. Rather, she's drawn to the more sensitive, thoughtful Joe. Beyond the obvious concern over the fact that he's Asian and she's white, Joe is loath to betray his partner. They've been inseparable since serving combat together in the Big Red One (Fuller's old unit, also the title of his 1980 masterpiece) in Korea. Meanwhile clues, including some provided by Charlie's alcoholic, artist friend Mac (Anna Lee, believably bohemian) leads the pair to LA's Little Tokyo district. Other than Joe's strange family name, The Crimson Kimono gets the details of Nisei life right. Though some studio sets were built for interiors, a great deal of the film was shot in Little Tokyo, a once-thriving enclave for the city's Japanese-Americans. Little more than several blocks of Japan-related businesses, restaurants, a Buddhist temple, etc., most Nisei actually lived in nearby Boyle Heights at the time The Crimson Kimono was filmed, and later scattered further out, to Gardena and elsewhere. When this author frequented Little Tokyo during 1993-2003, it was pretty rundown, though little changed from its appearance in Fuller's film. It's since been greatly revitalized and now is quite popular with locals and tourists. Except for the fairy tale fantasy of The King and I (1956), no major film about a white woman falling in love with an Asian man had been made since D.W. Griffith's Broken Blossoms (1919), a film Fuller claimed directly inspired this one. 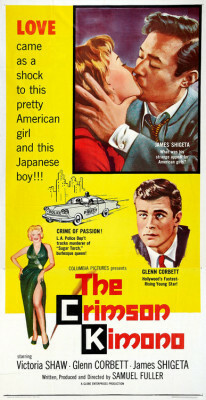 In the 1950s and into the ‘60s there had been a smattering of good and bad films about a white man falling in love with an Asian (or Eurasian) woman, but a picture with the roles reversed was far more daring, especially with wholesome, all-American Glenn Corbett as Shigeta's white rival. At the time such relationships were actually illegal in some states. Fuller's script goes a bit overboard with Joe's guilt, but authentically sells the idea because Joe and Charlie are bonded by their combat experiences, which Fuller knew well created unique lifelong friendships based on unspeakable shared experiences. Indeed, Charlie literally carries a pint of Joe's blood in his veins, alluding to a wartime transfusion. Also, Joe's conflicted feelings are spurred by Christine's interest in Joe, who since Korea has been tied to Charlie's hip. He hasn't exactly been repressing his own identity, but has obviously been following Charlie's lead, even applying for the same sergeant's exam Charlie obviously passed sometime earlier. The investigation in Little Tokyo, where Charlie and Joe train in the art of kendo, combined with his burgeoning if repressed romance with Christine, force Joe to reconsider his place in a white-dominated society. On one hand, Japanese-Americans are honored for their service during the Second World War (conversely, no mention is made of the Japanese internment camps) and all around are Japanese-Americans practicing traditional Japanese arts as well as attending Buddhist services. In the end, Fuller's aims were not to refute white intolerance of interracial couples but rather to confront Joe's imagined racism he's certain dwells deep within Charlie should Joe cross a line that, fortunately, only exists in Joe's imagination. Joe conflict might have crossed the line and become simply annoying, but because he's flawed he's more appealing because he's believable. Fuller's direction of this low-budget production is interesting. There are pages of dialog among two or three of the main characters covered in a single, long take, which Fuller keeps interesting usually by slowly dollying around the actors in a half-circle. This seems to have been a practical choice (time is money) as much as an artistic one, though it does help make the audience feel more intimacy with the three leads. However, in other scenes Fuller obviously didn't have time to shoot enough coverage or maybe he was just sloppy, as there's an inordinate amount of editing done with optical printers, making the already grainy, pulpy-looking movie look even grainier. In black-and-white and 1.85:1 widescreen, The Crimson Kimono gets a good transfer of a film shot and edited nearly guerilla style (optical printer close-ups, scads of hastily photographed and "stolen shots" sometimes out-of-focus, etc.) and from a distributor whose mid- to late-‘50s B-movie titles are, more often than not for some reason, on the grainy side to begin with. But it does look and sound as good as a 35mm presentation this reviewer saw at a Fuller retrospective at the American Cinematheque, not long before Fuller died. The 1.0 mono DTS-HD Master Audio is fine, the disc is region free, and optional English subtitles are offered. Supplements include Twilight Time's usual isolated music track and Julie Kirgo's liner notes. Better still is the late Curtis Hanson, a close friend and collaborator of Fuller's, discussing The Crimson Kimono with much passion and intelligence. It's in high-def but not clear when it was shot (Hanson died in 2016 after a long illness). "Sam Fuller: Storyteller" is a less interesting, an overview of the director's life and career. Several trailers are also included. One of Samuel Fuller's many intensely personal, unique films, The Crimson Kimono is a real diamond in the rough and a DVD Talk Collector's Series title.